Introducing!! 12 Days of Woodland Creatures (and Their Favourite Things)! Ornaments? Maybe for an advent calender like this? Or, by the end of the project you would have a set of woodland ornaments for the Christmas tree, just in time for the holiday season! Characters for felt storyboards, with velcro on the back? 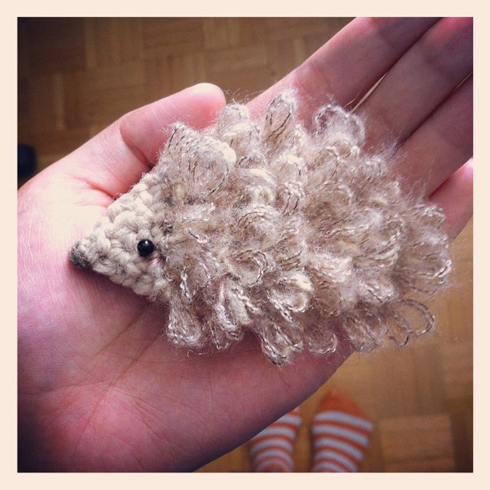 Every 2–3 days I will post a pattern for a crochet woodland creature (or its favourite things). And I won’t be pre‐announcing what the creatures are, so it will be a surprise every time! At the end there will be 12 patterns. You can crochet along for all of the patterns, or just one, or pick the ones you like. And if you send me pictures or blog posts about what you have created, I will share it here, like our craft‐along gallery a couple of years ago (that was lots of fun! :D), then we can see all the different and fun and creative ways that everyone has used for the creatures! AND!! Today we have our first creature — yup, you guessed it. The hedgehog! 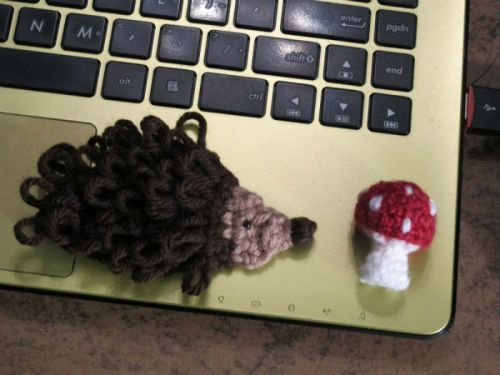 I also learned the loop stitch in the making of the hedgehog. There’s a great photo tutorial of it if you haven’t made it before. Worsted weight yarn — one colour for the body and a contrasting colour for the head. Row 1: sc in 2nd ch from hook, sc in each ch across, turn. Row 2: ch 1, loop stitch (lp st) in each sc across (4 lp st), turn. Row 3: ch 1, 1 sc in each of the next 2 lp st, 2 sc in each of the next 2 lp st, turn. Row 4: ch 1, lp st in each sc across (6 lp st), turn. Row 5: ch 1, 1 sc in each of the next 4 lp st, 2 sc in each of the remaining 2 lp st, turn. Row 6: ch 1, lp st in each sc across (8 lp st), turn. Row 7: ch 1, 1 sc in each lp st across, turn. Row 8: ch 1, lp st in each sc across (8 lp st), turn. Row 9 & 10: repeat rows 7 & 8 (8 lp st). Row 11: ch 1, 1 sc in each of the next 2 lp st, *2 sc tog over next 2 lp st*, repeat from * to * twice, turn. Row 12: ch 1, lp st in each sc across (5 lp st), turn. Change to head colour, fasten off body colour. Row 13: ch 1, sc in each lp st, turn. Row 14: ch 1, 2 sc tog over first 2 sc, 1 sc in each remaining sc across, turn. Row 15: ch 1, 1 sc in each of the next 2 sc, 2 sc tog over the remaining 2 sc, turn. Row 16: 3 sc tog, fasten off. Make a mirror image of the above hedgehog shape by reversing the increases and decrease in the pattern, i.e. if the row ends with increase/decrease stitches in the pattern, start with increase/decrease stitches when making a mirror image, and vice versa. Leave a long tail for sewing when fastening off both the body colour and the head colour. 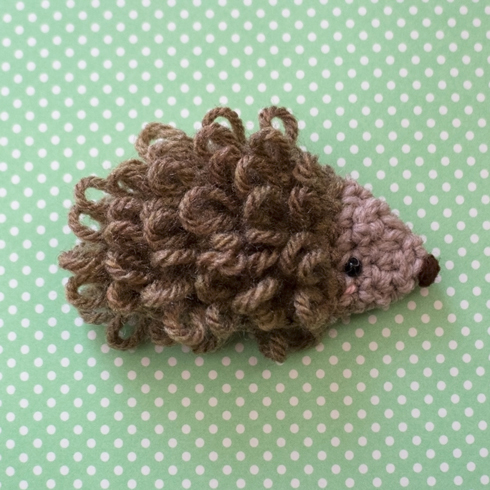 Sew on eyes, embroider nose and rosy cheeks, then sew the two hedgehog shapes together, using the long tail of head colour when sewing the head section and the long tail of body colour when sewing the body section. Make a back piece for the hedgehog using head colour following the pattern above, replacing all lp st rows with sc rows. Sew pin back to the back piece, sew on eye, nose and rosy cheek, then sew the back piece to the hedgehog. 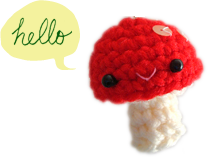 Hope you like the pattern, and please drop me a note if you want to join me in crocheting along! I love this hedgehog…I really want to join in. Adorable! I’ve started mine! Thank you! I absolutely couldn’t resist making one of these—what a fun, quick little pattern (as always. you are awesome at the cute‐and‐tiny! ), and a great way to practice loop stitch. I’ll be keeping an eye out for (a) the pattern on Ravelry so I can link this up! and (b) the other eleven woodland patterns. I can’t wait to make them. i will post this info in my next post as well! But I will totally be re‐visiting some of these patterns! I LOVE these. I’ll be making them in colours to match my gloves and handbags. Thank you so much for sharing. you’re so welcome Catherine! happy crocheting!